I know ! Everybody mumbles about freedom when it comes to riding a Harley – Davidson. I won’t. At least not in the sense most bikers would. Not now. If you have ever been on a bike, you know how a ride can make your thoughts wander. Mile after mile you are alone with you machine, the sound, the smells, with your thoughts. You have time to think. Unless of course some housewife decides to suddenly pull out of a driveway without looking or a pensioner to cross the road right in front of your front wheel. These are other stories. I was out on a long ride through beautiful if slightly cold autumn weather. The roads were clear of leaves, traffic reasonable, I enjoyed my run thoroughly. And yes, I felt free. A happy woman if ever there was one. After an hour or so I stopped at a set of traffic lights when I spotted a young woman with a plain black scarf on her head following a man I assumed was her husband. She always kept three steps behind him. She never looked up. Her husband did. He stared right in my face or what he could see of it. My black bandana covered my mouth and nose. Protection from the smells and dirt of the city I had just escaped. 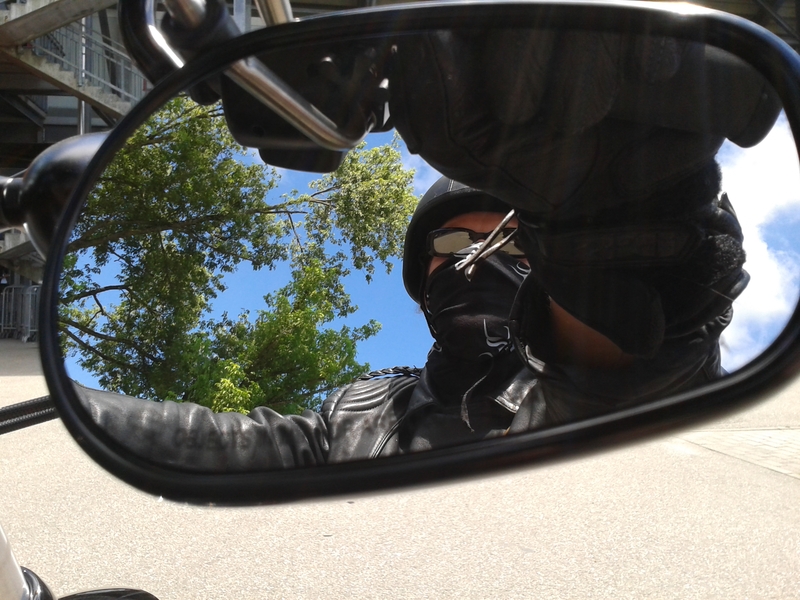 That was the moment when I felt the freedom of riding a Harley intensely as never before. That woman and I both wore a piece of cloth. I wore it to cover mouth and nose, she to cover her hair and her beauty. She walked three steps behind her husband. As they think a proper woman should. I let the clutch go and roared away full speed. Free. Independent. Strong. As a proper woman should. How the way you wear a piece of cloth can make all the difference.